Based on Vancouver Island, Vinyl Record Guru is the brainchild of music industry veteran David Read. With over 25 years in the music business in both Canada and the U.S., and with extensive experience in manufacturing, distribution, retail and as an artist, David has been involved in pressing millions of records. It's working out great. Everyone's interested in vinyl again. People used to say, when I told them what I do, "Oh, they still make records?" but now they say "Yeah, I saw it on the news." Bands from your basic indies looking for a short run to major label bands are all doing vinyl again, as well as reissues. What's the benefit of working with you as a broker rather than just going straight to a plant? Our benefit is we work with everybody. We place the jobs where it makes the most sense price-wise. Certain plants offer certain things and we work with all the plants throughout the U.S. and Europe. We can do anything, basically. What should bands think about when considering vinyl versus CD? Don't have too many tracks! On records you don't want to push it more than 22 or 23 minutes per side. We can do more, but the more you put on a side, the lower the volume is going to be. I think it's beneficial to go shorter. In the CD age things got a little out of hand ― suddenly a double album meant a 160-minute album. There are very few artists out there who can get away with a total quality 160-minute album. So it's a good editing process to go through. It makes the album that much better. 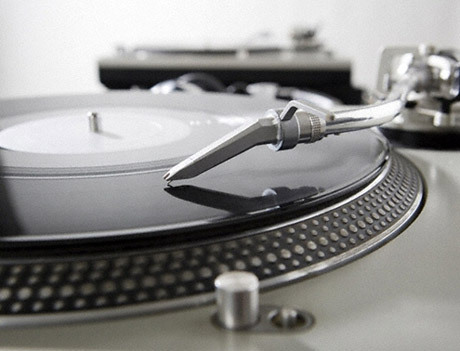 Is there a particular genre coming back to vinyl? Rock is definitely coming back more than anything else. For many years most of our projects were hip-hop twelve-inch singles, dance, electronica, techno, house. We'd get the odd rock project and get all excited. Now hip-hop and electronica have gone pretty much strictly digital and what we get is pretty much all rock. Everyone is coming back and doing records. And the beautiful thing is that you can offer a download that's included in the price of the record. That way you cover all the bases ― you get the record with the great package and the great sound, but also a copy for your iPod when you're out taking a stroll. Cuts the CD out of the whole thing. Are we going to see a move back to novelty packaging with pop-up covers and so on? There are some really cool projects out there. We've done many projects with coloured vinyl, or packed with posters, booklets CDs, DVDs... there's so much that you can do. We did a record that had a stencil ― the artist was saying you should spray paint the artist's logo on police cars! I probably shouldn't tell you that.